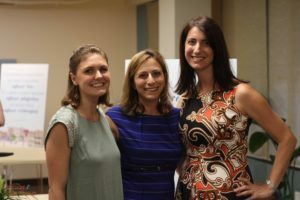 Hera Hub DC is excited to share Startup Stories from our members. We periodically interview incredible business women from a variety of backgrounds and disciplines. Our goal is to share our members’ wonderful stories with the public. A search for “small business success” delivers pages of articles, citing thousands of statistics, and offering hundreds of theories. The bottom line? To succeed in small business, a good idea and an entrepreneurial spirit are just the beginning. Many resources exist that enable small business owners to market and brand their businesses — great graphic designers, web developers, photographers, PR professionals, and more. But there are far fewer strategists to help entrepreneurs bring together a marketing program that truly impacts growth of their businesses. Most of the options available either don’t think with a bootstrapping mentality or are simply financially inaccessible (and larger in scope than necessary) for small businesses. That’s what inspired Popcorn & Ice Cream, a desire to make marketing strategy and program execution available to small businesses at a price they can afford. Our clients are small businesses, startups and small nonprofit organizations. We work with bricks and mortar retailers and restaurants, product companies and service providers. We help small businesses establish strong marketing foundations, engage with the customer they have and reach the ones they want. We provide consulting services and I am a frequent speaker on marketing topics for organizations that serve small business owners. – Respect for one another, for our clients and for our work. – Integrity and a commitment to a job not just done, but completed to the best of our abilities. – Commitment to the success of Popcorn & Ice Cream and clients alike. Also at the top of the list – gratitude. We appreciate the trust our clients place in us and feel honored to play a small role in their success. We know that without our clients and their passion for building something incredible, there would be no Popcorn & Ice Cream. We like to say that salty and sweet and crunchy and creamy make great combinations. Like a good marketing campaign, they highlight and complement the other ingredients’ best attributes. And like a great small business, there are endless delicious flavors that offer many new possibilities. Click here for more on our inspiration. What do you love mo st about your work? I truly love small businesses. I love seeing an entrepreneur turn a flicker of an idea into a profitable business. And I love watching passionate people turn their talents into high-demand products and services. I’m inspired by dreamers and motivated by doers. Managing growth. In professional services, time is both the most valuable and scarcest resource. The only way to sustain growth and achieve our goals comes by way of hiring new resources. This however presents other challenges as we refuse to compromise the premise on which this business was established – providing quality, qualified marketing support to small businesses at a price they can afford. We refuse to increase prices to hire ahead of new business or compromise quality with lesser resources. To address this challenge, we manage growth through addition of part-time consultants and freelancers who work as members of our extended team. We hire those who share our passion for small business, as well as commitment to excellence and creativity. We work with the best minds for small business regardless of where they’re located in the US. To continue to make marketing strategy that truly impacts the growth of a business available to business owners nationwide and around the world. My book, Customer, LLC, is a great step. Next up – online courses and in-person workshops in a city near you! Small business is hard. It’s easy to get caught up in the day-to-day details and to dos. When you’re feeling overwhelmed or burnt out, take time to take a step back. Sit in awe of everything you’ve already accomplished. Remember why you started your business in the first place. Embrace the business you love. When you start by reminding yourself of your passion, the ideas, the motivation and the success will come. Hillary’s passionate abo ut small business and customer-centric marketing. 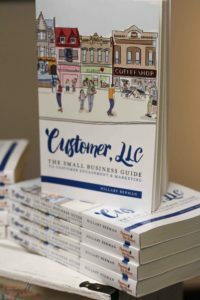 She leads the Popcorn & Ice Cream team, is the author of Customer, LLC: The Small Business Guide to Customer Engagement & Marketing, and a Google Small Business Advisor. No, she doesn’t get much sleep. 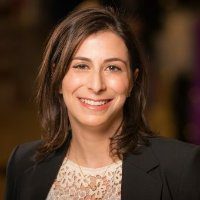 Hillary brings experience working in and for businesses of varying size to her small business clients. Cutting her teeth on Madison Avenue, Hillary got her first taste of small business at a dot.com reminiscent of Facebook, but sadly before its time. Upon moving back to Washington, DC, Hillary worked for a start-up technology company before turning back to the agency world. Prior to launching Popcorn & Ice Cream, Hillary worked with her husband to build and grow a financial services business. A graduate of Syracuse University’s S.I. Newhouse School of Public Communications and the University of Maryland’s Robert H. Smith School of Business, Hillary can also be found building lemonade stands with her three budding entrepreneurs at home.